A simple quick-cooking technique is to make extra food at one meal for future meals. Or, to prepare food ahead and freeze for enjoying at a later time. 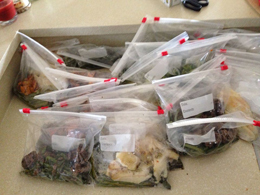 One easy method of freezing foods, including liquid foods such as soups and stews, is to freeze them in freezer bags. Following are some general freezing tips, followed by specific tips for freezing in freezer bags. If you’re making extra food at one meal for future meals, separate and refrigerate the portion to be served later BEFORE you put the food on the table. This keeps food quality higher by preventing “planned-overs” from becoming “picked-overs.” It also helps keep food safe. Keep an appliance thermometer in your refrigerator and in your freezer to assure they stay at 40° F or lower (refrigerator) and 0° F or lower (freezer). Buy a thermometer at a discount, hardware, grocery store or other store that sells kitchen cooking tools. Freeze foods in portion sizes you’ll need for future meals. For example, if there are two in your family and you each eat a cup of rice for a meal, freeze in two-cup portions. Place a shallow container of food on a cooling rack to allow air to circulate all round the pan for about 20 to 30 minutes. Limit depth of food to 2 inches. Cool foods to refrigerator temperature before bagging them for your freezer. It is OK to refrigerate foods while they’re still warm. LOOSELY cover food upon refrigeration. This allows heat to escape and protects the food from accidental contamination from other foods during cooling. Speed freezing and hasten thawing by freezing foods in a thin, flattened shape in freezer bags. A rounded shape takes longer to thaw through to the middle. Flatter packages also will stack better in your freezer. Place the freezer bag in a container such as a quart measuring cup. Standing the bag upright also helps if you are filling the bag with a more liquid-type food. You may wish to double-bag liquids as an added precaution against leakage. Open the top of bag and and enclose the edges around the bottom of the wide-mouthed funnel. Add food, in desired amount, through the funnel. Hold edges of the bag in place as needed. OR, use some type of scoop — such as a measuring cup with a handle — to transfer the food to the freezer bag. additional helpful information, such as form of food (sliced, chopped, etc. ), any special ingredients. It is helpful to place filled freezer bags on a flat surface in your freezer, such as a metal pan. Do not stack freezer bags until frozen so they will freeze faster.After they are frozen solid, the bags may be removed from the pan and stored, stacked, directly on the freezer shelf. Or turn them on their edge and store them vertically. This is an especially good idea when freezing liquid foods, such as soups and stews. DO NOT thaw perishable foods at room temperature. If perishable foods are left at room temperature too long, bacteria may grow and produce heat-resistant toxins that can cause food-borne illness. Cooking may not be able to destroy these toxins. It’s best to plan ahead for slow, safe thawing in the refrigerator. Small items may thaw overnight in the refrigerator. 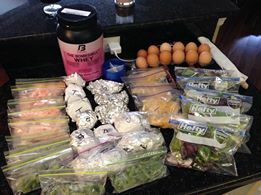 Up to 5 pounds of food should thaw in about 24 hours. If there is the possibility a thawing package might leak, you may want to thaw it on a plate or a pan. Food may be transferred from a freezer bag to a microwave safe container for thawing in the microwave. If the freezer bag manufacturer says it is OK to thaw foods directly in their freezer bag, follow manufacturer’s directions for such things as venting, recommended heat settings, types of foods suitable for microwave-thawing, etc. for that specific bag. Also, follow manufacturer’s directions for your microwave. While you may be able to satisfactorily defrost food in some freezer bags in the microwave (check manufacturer’s directions), DO NOT cook the food in the freezer bag — unless recommended by the microwave manufacturer. At the higher temperatures used in the microwave cooking process, it is possible for the plastic to reach melting temperatures.